Salbutamol inhalers are fast acting. They make breathing a lot easier, generally within minutes. They are also known as either a “reliever” or “blue” inhaler. They work by helping to keep the airways open. 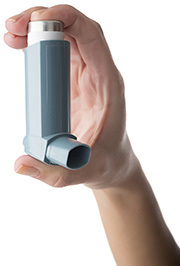 If you already use a Salbutamol inhaler and have been diagnosed as an asthmatic you may be eligible to come in to the pharmacy to purchase an inhaler after a consultation. Walk-in or book an appointment to see our specialist Pharmacy team for further information and treatment options.